10,000 DaysDay 128: Say what? Okay, young Whit8143, first of all, you're missing an apostrophe in your question. Hey, it happens. Second, who planted the idea in your head that Rebecca Skloot is a better and more effective writer than I am? Sure, she's sold a gazillion more books than I have, but listen kid, I know my way around a dependent clause or a reflexive pronoun, and don't you forget it. That said, I signed up for Brainly so I could respond. 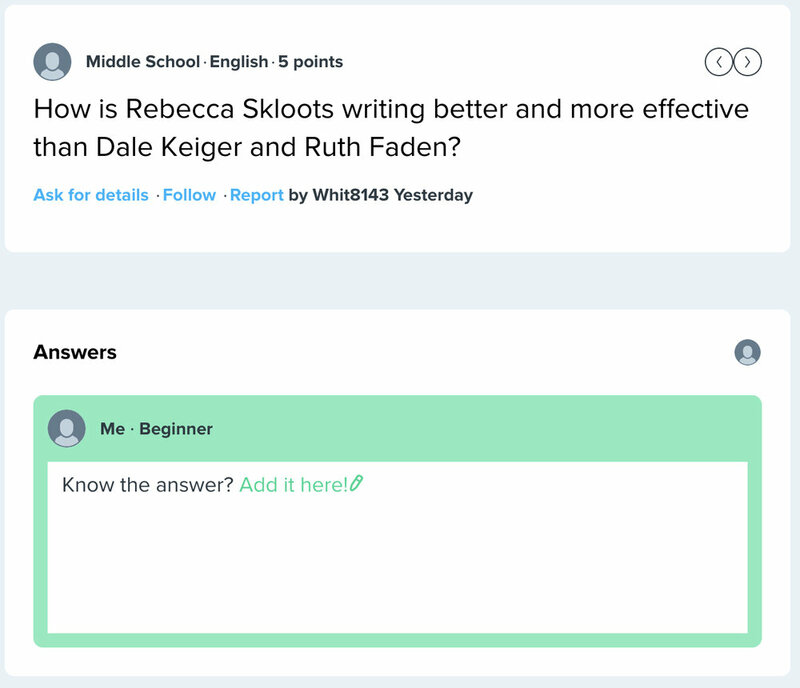 Told young Whit that I didn't think I could answer his question, but I was the Dale Keiger in question and knew both Rebecca Skloot and Ruth Faden and would be happy to answer any questions if it would help with his assignment. Plus I'll be able to straighten him out on this whole "better and more effective" thing.